A boy named Peter grew up at a pineapple plantation in Queensland, Australia. Since he was a child he developed a fondness for gardening and dreamed of having his own fruit orchard. 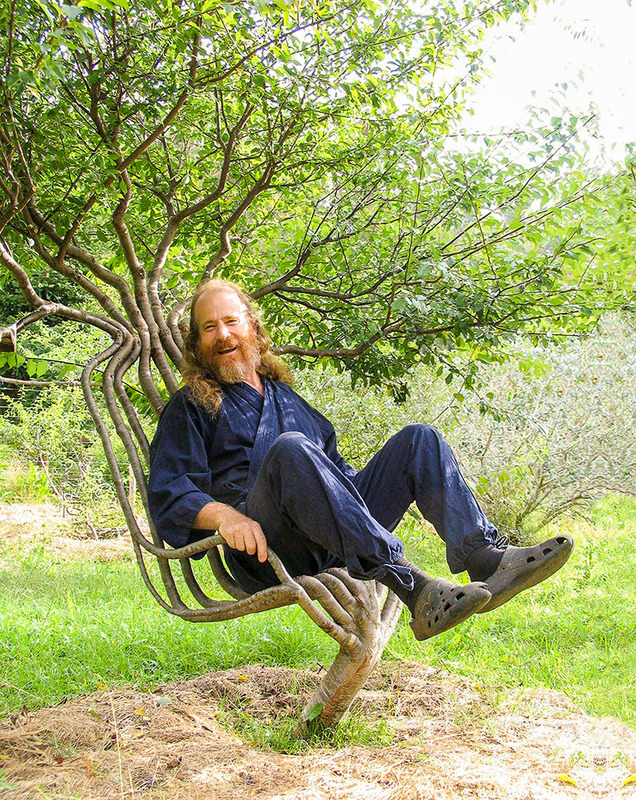 But once an unusual, if not a «very strange» idea came to his head: «Is it possible to grow a chair?» It was this question that made Peter start researching trees and looking for methods of shaping them into a variety of forms, which years later led to consolidating the accumulated knowledge and the creation of Pooktre. 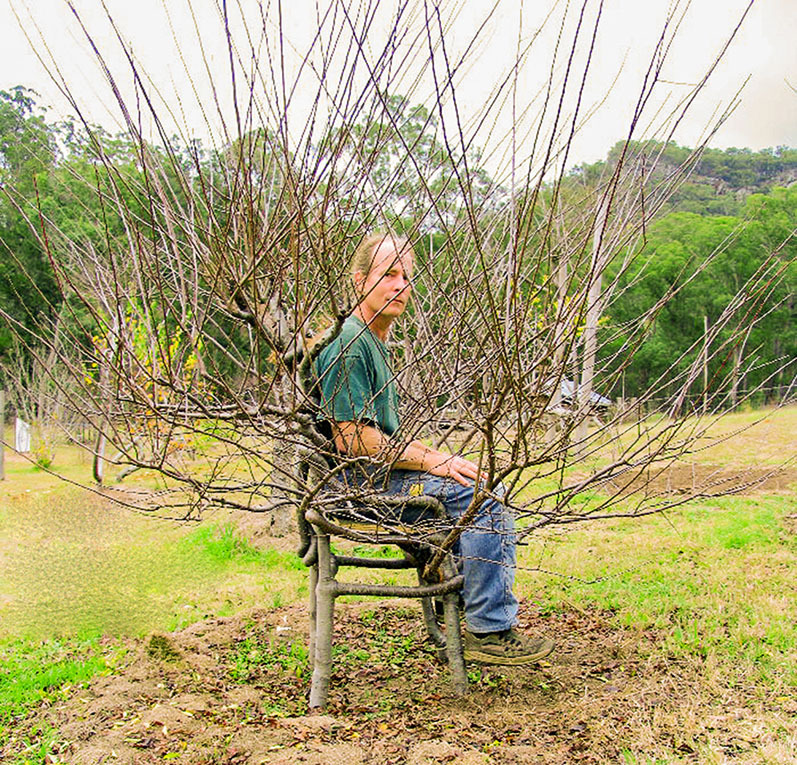 Australians Peter Cook and his wife Becky Northey told us how they grow «display exhibits» for their amazing garden. - Peter, Becky... There are several ways of shaping a tree; for instance, you can simply bend it or cut it. How is your method of tree shaping different from others? There are only two most basic methods. The first one is the method of instant tree shaping that is mostly based on pleaching the branches. 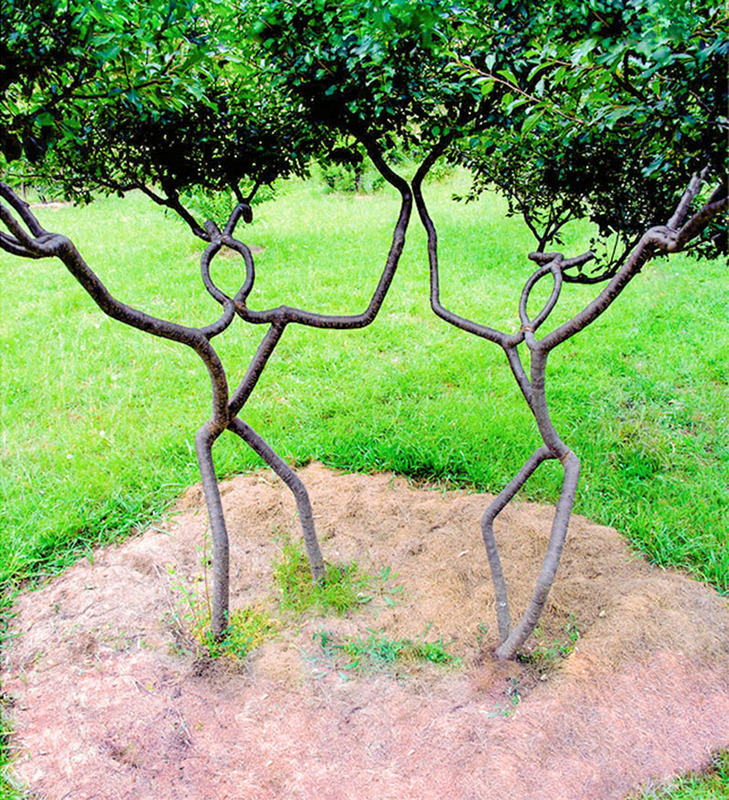 Most often it is called Arbosculpture. And the second way is to gradually shape a tree as it grows. And that is the Pooktre way, which is what we are doing. To explain the difference between these two methods, here is a simple example. Let’s say you want to shape a tree into some sort of a braid. If you interweave three already formed branches of the tree with each other, i.e. 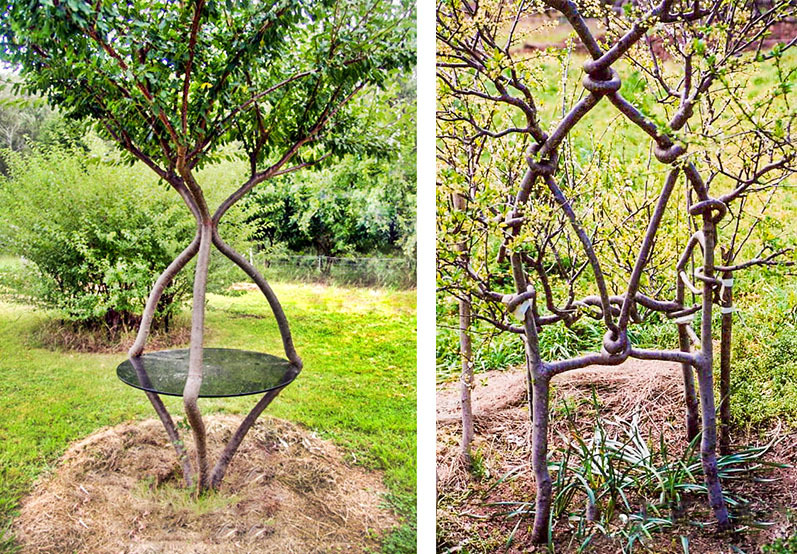 create a shape instantly, that’s Arboscuplture. But Pooktre in this case suggests growing the braid instead. For that you’ll need to first to create growth pathways, and then over several subsequent seasons to direct the growing branches along these pathways, thus creating natural braiding. In truth, there are very few people in the world who practice tree shaping as an art form – probably about 20 people, four of them already dead. And very few of them have published anything regarding their work. This means that there might be other methods of tree shaping that we might simply not know of. - What species of trees did you work with and how did you choose the most suitable ones for your goals? Since 1996 we have been using wild plum trees (Prunus cerasifera myrobalan) for practically all of our designs. And the more different tree species we tried, the more we understood that wild plums are the best for shaping. We have also used such species as plane tree, black cherry, crape myrtle, redbud and cootamundra wattle. But the latter one, for instance, turned out to be infectible by woodboring grubs which is a serious problem for us. - How much time does it usually take to grow some sort of a shape? Before the start we always make a detailed drawing of the design we want to create. Then we use wire to create a supporting framework and shape growth pathways on it. And then we direct the tree to grow along these pathways. The shape is formed over the first few years of the tree’s life. Smaller shapes can be grown within one growing season. Larger projects such as chairs need two or three years to come into the needed shape. But before you can sit in that chair you will have to wait for five to ten years. Or here is another example: it took the trees shaped as people 8 years to mature. But then there are also designs that need even more time than that. And we feel the most invested when we do the most time-consuming projects. - If a tree is shaped according to a predetermined pattern, then how do you understand how the tree would behave at this or that stage of its growth? All trees have some basic tree lore in common: they all need light, water and some place to grow. But the importance of these elements changes depending on the tree species. There are also basic requirements for shaping trees that apply to all trees but the importance of them changes depending on the individual tree species and its quirks. But in general trees are very predictable. So once you have an understanding of the tree lore of a tree species, you can plan your design with the quirks of that tree incorporated into its design. As an example, let’s say we have a willow or some other tree that can be grown along creek beds or river banks. Due to them having the so-called «muscle wood», they are capable of standing back up after a flood. So when shaping a willow along the growth pathways, for the first two years it will look wonderful. But by year three you will notice its «muscle wood» having distorted your design. And this distortion will only continue and intensify over time. Whereas, for instance, pear trees have almost no «muscle wood» and that is why they are extensively used in espaliers. In our business we had to learn everything by trial and error, and that was quite difficult due to the long time spent experimenting. By way of example we will tell you how we shaped one of our chairs. 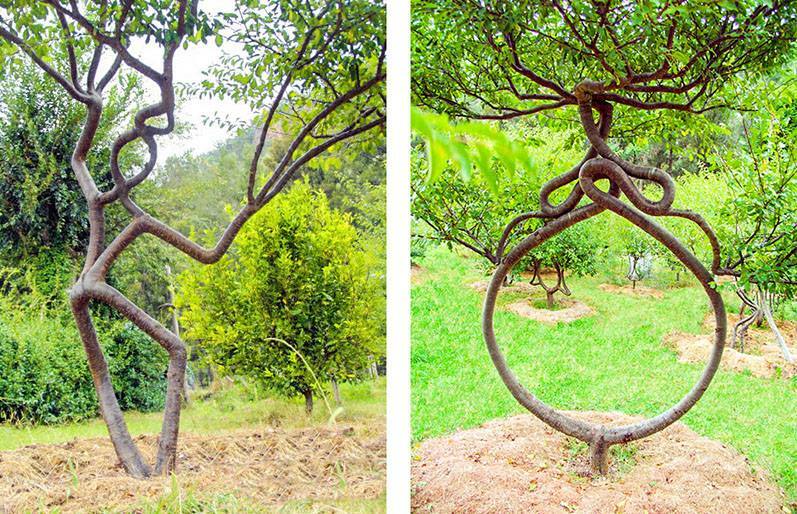 We grew the tree in such a way that it made loops around itself. We assumed that this would create the necessary joints in certain parts of the chair. But in five years we decided to do some intermediary examination and understood that this would probably not work. So we harvested one of the chairs and left the other one growing. We continued to grow that chair for five more years doing the same things as before. And only after the total of 10 years we found out that our initial assumptions were correct, and this method does work after all, and beautifully at that! This is why we need to constantly improve our process, although right now everything is pretty clear for us: we design a piece and we know for sure what we are going to get in the end. The hard part is finding the right combination of methods and doing the steps at the correct time and in the right order. After all, it is hard to find a path in the dark when you do not even know if a path exists! - How large is the risk of damaging the tree when shaping it? If you only work with the shaping zone, you won’t damage the tree. The damage occurs when you bend a tree or a branch beyond their normal flexing range. And we never do that. The shaping zone is the key to shaping the trees. As the new cells form, the stem and the leaves swell and expand, forming what we call the growing tip. The distance between the leaves lengthens to a point where the cells reach their mature size. The cell walls are still soft at this point. This is the beginning of the shaping zone. It’s the exact area of the tree that you can shape, and the shape of the entire tree is determined right here. 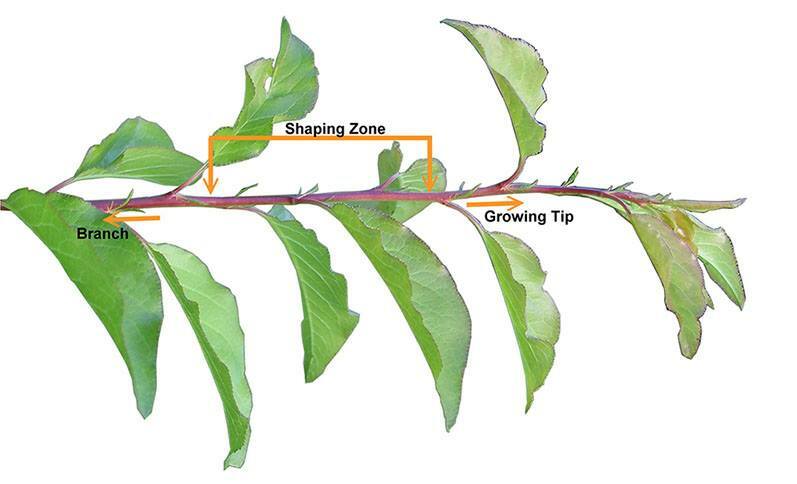 The shaping zone can vary in length depending on the rate of growth and the tree species. Besides, it only appears when the tree is in active growth. When working in the shaping zone you are establishing the orientation of the cells into their fixed shape. The further you are from the shaping zone, the more fixed is the cells’ orientation, and here they become a part of the tree’s structure. You can work with a tree outside the shaping zone too, but extra care must be taken when doing so. Otherwise you may damage the tree, and even a small damage can lead to unpredictable results. But there is one more parameter that needs to be considered when shaping a tree. It’s the tree’s flexing range, i.e. the degree of how much you can flex the tree without damaging it. The larger the tree’s girth is, the less is its flexing range. When you go outside the tree’s flexing range, the cells of its branches get damaged. If you put your ear next to the branch while flexing it, you will hear the very audible sound of the cells rupturing. You do not even have to go much past the normal flexing range for that. This amount of damage cannot be seen by the naked eye, but the more excessive the bend, the more damage is being done to the branch and the more undesired effects you are going to get. You can damage the tree’s vascular system, which will either slow down or stop its growth because the tree will spend all its energy repairing itself or otherwise the branch will simply die back. The negative effects might not appear at once but in most cases they will appear in two-three years. And this whole time will have been wasted. Using the instant Arbosculpture method of bending a tree into a certain design gives the immediate impression of a finished piece. But for that one must bend the tree past its normal flexing range. We don’t use this method because the resulting damage is reprehensible. While a tree grown using the shaping zone method is already in its original shape and will continue to grow at an even, balanced and normal speed. - How long can these shaped trees live? That depends on the tree species. For instance, the tree that Axel Erlandson chose to use (sycamore) can live up to 600 years. Olive trees can live up to 2000 years. Given Axel Erlandson’s success rate and what his daughter and the newspapers of the time published, we have a good reason to believe that he mostly used a gradual shaping method. Besides, sycamores cannot be shaped in any other way except gradually. Today Axel Erlandson’s trees in Gilroy Park (California, USA) are over 70 years old. - If someone decided to start shaping trees using your method, what advice would you give to that person? As this art form takes such a long time, we have seen a lot of people who start out with big plans but do not have the slightest idea as to what steps they need to take to create successful shaped trees. There is actually nothing inherently difficult about creating reproducible designs once you understand all the different aspects of this practice. It’s somewhat similar to learning dancing or driving a car. Put someone in a car who has never seen one and ask them to drive, and not much is going to happen for quite a while. Add to that the fact that in our art it can take as long as 10 years to find out whether or not you did the right step at the very beginning. The biggest challenge is knowing for sure what you are doing and what results your steps are going to bring. So don’t yield to the temptations of Arbosculpture’s fast results, because it can cause damage to the tree or delay its growth and, as a result, the tree may die back. And it will take years before you find that out. Since we published our book ‘Knowledge to Grow Shaped Trees’ people from all over the world have been contacting us, and now they are growing their own trees using our methods. When choosing a suitable tree for shaping in your area, do some research. Examine the mature, well-growing trees in your neighborhood area, especially the ones least susceptible to destruction by insects and most resistant to diseases and weather. Find out how much light the selected tree species needs for normal growth, how long it lives, what type of soil it prefers, how easy it is to graft it. Only after finding all that out you can get started. - How do you see the future of Pooktre and what are your planned areas of development? Have you ever thought of creating a business based on what you do? Until today we haven’t had any attempts at starting a business. But now we are in the process of developing a tree shaping consultation service, as well as writing our books. As of today we have already published three books. We would really like it if our knowledge was passed on and put to practice. We have the privilege of giving the world what we have learned about trees, and we would very much like this experience to develop from being just our knowledge into becoming basic human knowledge. We are thinking of moving to Europe and we will do that as soon as we accumulate enough ideas on how to spread our knowledge further. We want to create an open garden and exhibit our best works there. And we also plan to display certain pieces in museums and art galleries. We also plan on lecturing, organizing workshops and projects, as well as selling our books and expanding our online presence. We have done a large number of living infrastructure projects, and this infrastructure can be installed in cities, parks and gardens. By living infrastructure we understand decks, walkways, park furniture and even living buildings that won’t fall down in an earthquake or blow away in a hurricane. We also have pieces grown to be harvested for jewelry, high grade indoor furniture, fairy-tale doorways and windows. All of this is just a small sample of ideas of what can be grown out of our designs. You cannot imagine how many wonderful things you can grow out of trees. And as soon as people understand how easy it is to do that, trees will become integrated into cities at the level that no one even dreams about now. Probably in the end it is going to change the way we interact with nature. - And what else do you see the social value of your work in? Living in a symbiosis with the planet is the only way humans are going to survive in the long term. We must be working with the planet and not against it. Having living infrastructure in our cities would be so great for us, as well as the animals and bugs we share this planet with. We regard our pieces as art because art is fundamentally a new way of seeing the world. Think of it this way: the time you spend shaping a tree is captured by the tree and then amplified. And now we have an opportunity to make it so that in 20, 30, 50 or maybe even a few hundred years from now people are able to see the tree that you have shaped. Regardless of whether or not you decide to shape a tree that time is still going to pass, so why not leave a gift for the future? Sign up for eRazvitie.org on our Facebook page not to miss new articles.